Since their debut with The Poison album the Welsh Rockers of Bullet for My Valentine constantly evolved and shown remarkable talent to bring new musical components, blending new sounds and influences. With their 6th album, Gravity, released on 29th of June 2018 at Spinefarm Records. – Matthew Tuck (Singer, Guitar), Michael Paget (Guitar), Jamie Mathias (Bass) et Jason Bowld (drums) have the courage to a change drastically the sound formula. Electro and synths mixed with heavy guitars, powerful drums, sharp, anthemic and catchy choruses, the quartet unveil with this new record an awesome twist and mix of emotions that I totally love. 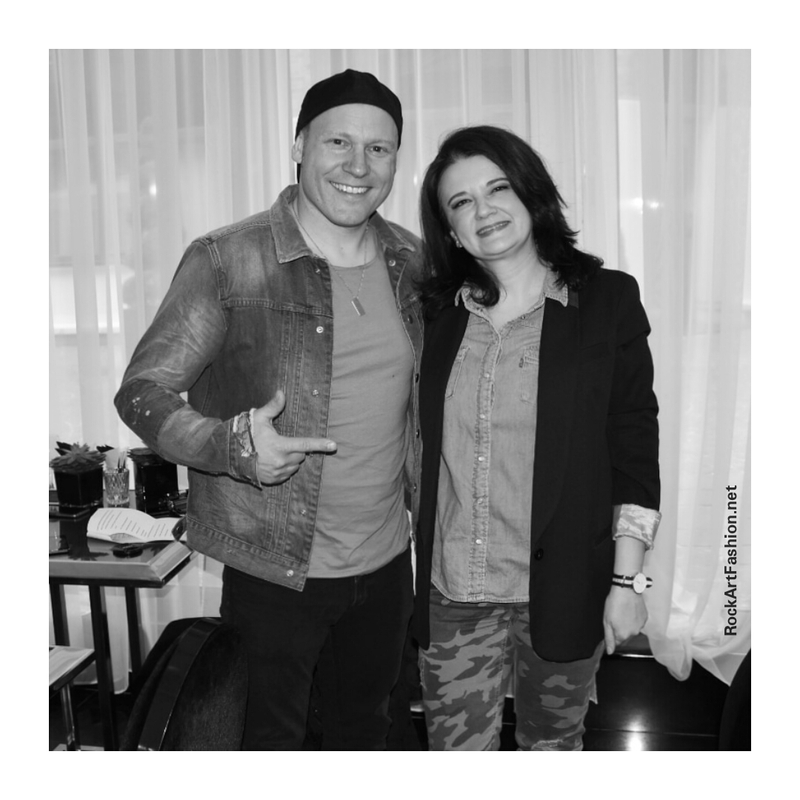 I had the great pleasure to meet the newest member of the band, Jason Bowld and have a fun lovely chat about the album, drumming, loving Europe, playlists and much more. First album as official member of Bullet for My Valentine, how was the experience? Jason: It was amazing. It’s been natural as I’ve been playing with them since 2015, having toured all 2016 as well. We started to write the album in April 2017 and it was hard work because the band kind of changed the sound lately and there have been a few divisions in the camp about how we are gonna sound. But I guess it’s always like this when you write a new album. Every album is a challenge and it should be as you have loyal fans to please. The whole process has been great, really excited. Let’s talk a bit about this change of sound. I found it very heavy but much more melodic in the same time. Do you agree with me? It’s very contrasting but I think it is the most eclectic album ever. These are the keywords. Jason: Yes, I do. I think it fits a nail in the head because this album got the heaviest moments that Bullet ever had but also the most melodic ones. It’s very contrasting but I think it is the most eclectic album ever. These are the keywords. Each song has his own thing going on but there is also a common thread running to the whole album. The lyrics, the vocals are very powerful, it’s a common theme lyrically about Matt’s torment these past years with break ups and friendships dissolving in the band. And although that sounds quite negative, I think it is finally positive because it’s about a fresh positive beginning. It could be a rebirth in some ways. The lyrics are very emotional, evoking broken relationships. Jason: Yeah, that’s right. I think that some people might say, hey you are a metal band, that’s kind of soupy to sing about but I think it’s more heavy to sing about real life stuff that it is to sing about donjons and dragons. I think a lot of people will relate to it, it’s an old cliché but you can interpret a song how you want. That’s very clear what the songs are about when you get into lyrics. It’s very intimate, personal and quite deep. Gravity- why this choice as album title? Jason: Gravity was the first song that we wrote. We really did not choose the name of the album with any kind of meaning but accidentally the number 6 (as 6th album) is in GRAVITY in roman numerals “VI”, so it works out good in the end. It was a happy accident that reflects the album – heavy and light moments. We found this cool to have an album title with just a single word – it’s simple and effective. As a drummer what is your favourite song on the album? Jason: “Piece of Me”. I love that song as a song and as the work of drumming. It has a groove quite unique and it’s more tricky to play that people think. It has a lot of feel to it, it’s a kind of urban funky groove in the verse and double kick in the chorus, a lot of good dynamic. I like all the songs because of the dynamics: light then heavy. What about your favourite playing live among the older songs? Jason: One of my favourite older songs to play live is 4 Words because it is very heavy and fast. I also like to play Tears Don’t Fall– it is so anthemic and love when the fans are singing the words. It takes you to a new level. What can you tell me about the writing process of the album? One of my favourite songs is Under Again, can you tell me more about it? Jason: Writing process was varied. When we started writing the album in April 2017, we started jamming in room, playing metal songs but we just felt flat. We were a bit lost, we did not know to which direction to go. We did not want to write the same album again, we had to find another source of inspiration. 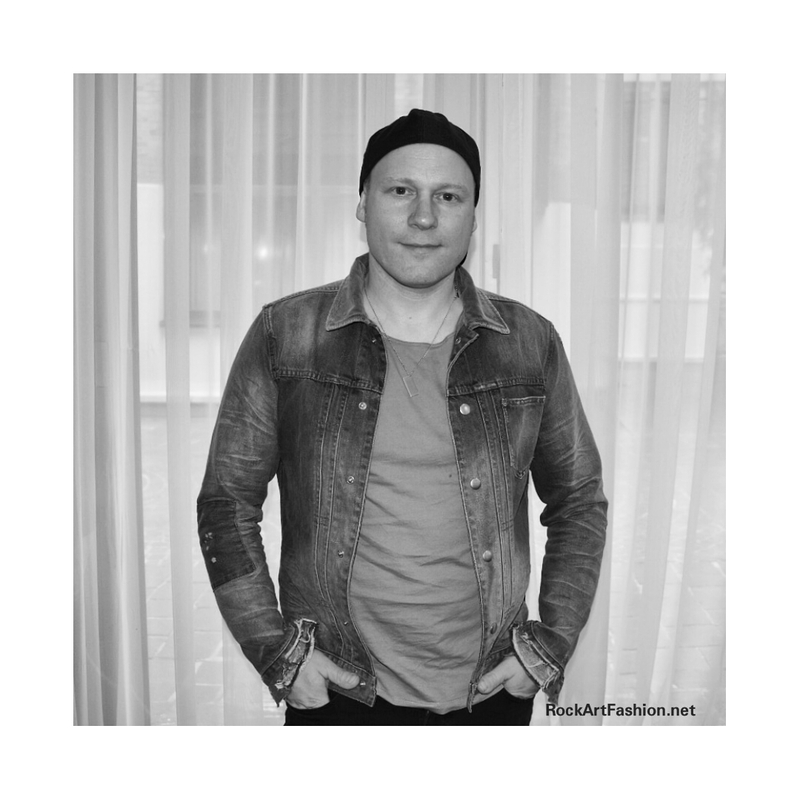 Matt has often written with Matt Schwartz, a dance producer who is famous for Electronic Dance Music style. Obviously, it isn’t about what Bullet is about but it was his way to get new inspiration, so Letting You Go and Under Again were born from that process. Gravity was the first song we written in studio, and then we co wrote For The Very First Time with our producer. For the rest, we were written of the back of those core songs, it was a sort of catalyser to find different directions. So over all, what would you say that it was the most difficult to write this album? Jason: I think having faith in this new direction, because at the time we found it mind blowing. It feels like a drastically different step for the band sound. Are we were doing the right thing? But finally, it’s a different direction but it is not massively different because Bullet always have been an eclectic band, never been a metal core band, always had both melodic songs and heavy songs. I think that having that sustaining faith and confidence in what we are doing for 8 months, this was difficult. We had disagreements which is natural, it’s hard to have 4 people to agree on something but we all want to do what was good for the band and for our career and for the fans. So yeah, it was a painful process but as I always said we do not win a marathon by walking, it you have to go through a pain. We’ve done everything we could, and we hope the fans will love, we think they will, because we believe in it and when you believe in something your wish come true. You also change the label, was it a challenge to start working with Spinefarm record? Jason: Couldn’t be much better because they have so much love for the band. There are some really experienced heads at Spinefarm that works in the industry for years and they know exactly how it works. They just have been so supportive, we could go to different studios to write and to find creative vibes for the album. Jason: Yeah, I started when I was 11 years old. I am from a musical family; my dad was in a band. He played guitar he was into Black Sabbath. 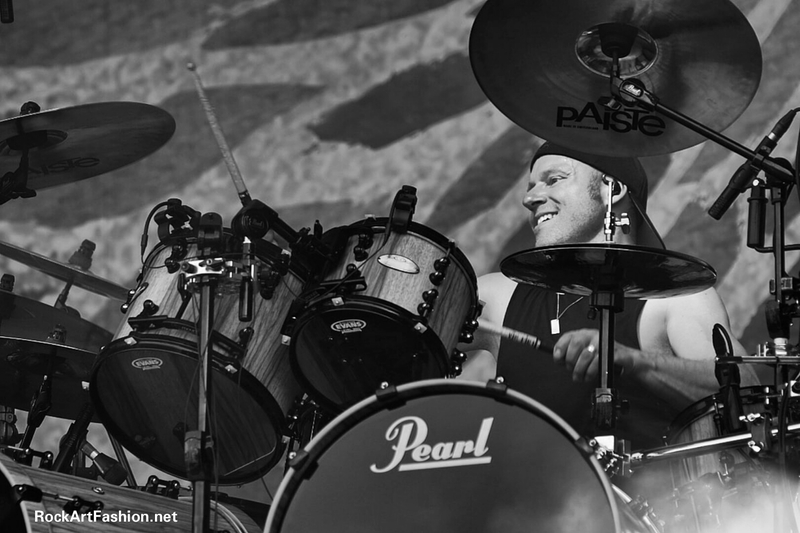 I was very passioned about drums and when I was 20 years old, I started to venture out and joined a band called PitchShifter which was my first professional band. I had an album with them, I toured the world twice. Then I had a period before getting involved with Bullet when I was a session drummer. It was bit of mercenary. It was something that took me 18 years before joining again and being again a member of a band. I played with a lot of different people, bands like Killing Joke. I also had a side project with Matt – AxeWound and this is how I got involved with Bullet. I started playing with them in 2010 on the Arena Tour and our friendship with Matt develop. I was playing 100% with them since end 2015 and now I am a full member committed myself to the band because I believe in it and I can see that everything is incredible, especially the fan base. 6 albums – not many bands survived so long these years. It’s definitely worth to me to dedicate my life to it. It’s easy to form a band but it’s hard to remain a band. The secret of longevity is like in any relationships. You have to work hard all the time. It’s a constant work. The 6th album is not easy, we have to make it better than all the others. Never rest on your laurels. Do you have a major drummer the influence you in your drumming? Jason: There are quite a few. I think one, when I was very young and because of my dad being into Black Sabbath, it was Bill Ward. I love his drumming. I also like Mitch Mitchell, he played with Jimi Hendrix. For the modern ones, when I was teenager – Dave Lombardo of Slayer. Also, Josh Freese, he is not very well known, but he played to a lot of bands like Nine Inch Nails, Suicidal Tendencies. I think he did a session with Sting also. 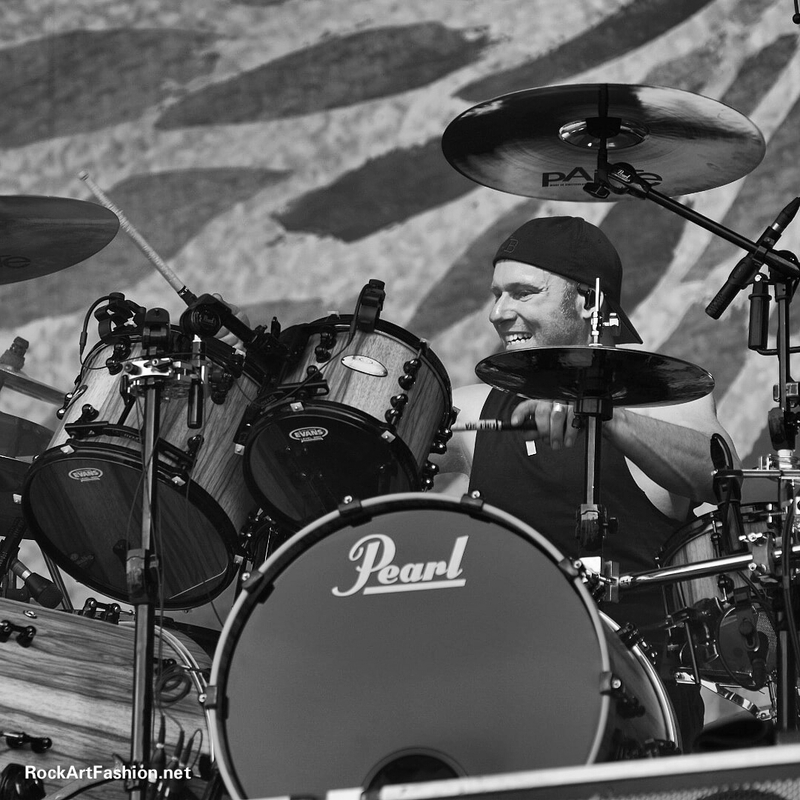 He is my all-time favourite drummer. But I do not want to meet him because I met some of my favourite drummers and they are not really nice people (Laughing). Never meet your idols. What about your playlist? What do you listen? Jason: What do I listen to? Well, you will be shocked. There is not much metal on it because I play heavy music all the time so I need a break from it. Recently, I went to see Def Leppard live, they are still really good. They took me back when I was younger. They look after themselves, they care what they do, so I’ll listen to some Def Leppard. I often go down to nostalgic roots with Spotify; You can do what you want, you can listen to some ABBA songs or all that songs that gives you a thrill and remind you a period of your life. I love Nine Inch Nails, I am a big fan of Chelsea Wolf – an obscure American artist –kind of gothic, dark. Moody style. My playlist changes all the time. We toured with Avenged Sevenfold and I listened to some of their stuff. I like some 80’s stuff like Duran Duran. What’s your fashion style? What do you wear on stage? Jason: I think it’s important to mix and match clothing. I like All Saints stuff, they are not so expensive and it’s a very good quality but you can also pick up some stuff to Asos or H&M. Mix and Match, so do your own identity. It’s important and It’s easy nowadays. On stage, it is quite tricky as I play drums and I like to feel a bit of freedom. I generally ware shorts and loose fitted T- shirts but I’d like to be more creative. Like wearing some crazy outfits without being covered with glitter. Actually, I am a simple kind of guy so I’d like to keep it simple, edgy and not pretentions. That’s my vibe. Do you guys have a colour code when you are one stage? Jason: We are trying and we did discus it this. Matt being singer obviously it is important for him, he is the centre of the attention. He will be in photos more then any of us because of social media. You are entertaining at the end of the day and I think a lot of bands or musicians do not have that strong image side of things. I think you have to focus on it. You have to put some effort on what people are going to see. We are trying to change things every night. Nothing crazy but make sure that we have some contrast and be sure we are not looking like we had a fight or something. Are you considering wearing suits again? Jason: We will be in Europe for the summer festivals, then in August we will be in Japan, US in September back in Europe in October and November possible Australia in December and probably similar kind of things next year. I love Europe. I love to come back here. It’s my favourite place to tour. I love the fact that you can be in different country in an hour or two, I love the food. People are like family. I feel home in Europe. I am really sad that UK is leaving Europe. It’s evil. How about the fans? Are they different in Europe, Asia, US? Jason: I think that there is definitely a common thread with fans: they are very passioned fans and they are just lovely people. There is really no aggressiveness in our fans, they are intelligent and they appreciate good music obviously. But they could be different also from one country to another. When we played in Europe for the last cycle, we had a French couple that follow us around for every gig. We befriended with them, we had drinks with them occasionally. They are really nice people. I don’t think that many bands would socialize with their fans. Some bands will even stand official line between them and the fans. This interview is finished – Is it something that you would like to tell me about the album or about the band and I did not ask you? I think it’s more hopes and wishes. I hope that Bullet family enjoys the album as much as we enjoy writing it. We think that it’s the best thing that the band ever done. We just want everyone to listen to it as an album and not just pick up one track, just sit down and listen to it from start to finish because it’s a bit like a journey. It has a strong opener, some angelating emotion in the middle and definite closer. There is a lot of love we put into it. Depuis leurs débuts avec l’album The Poison les Rockers Gallois de Bullet for My Valentine ont constamment évolué et montré un talent remarquable pour mélanger des influences et apporter de nouveaux composants à leur musique. 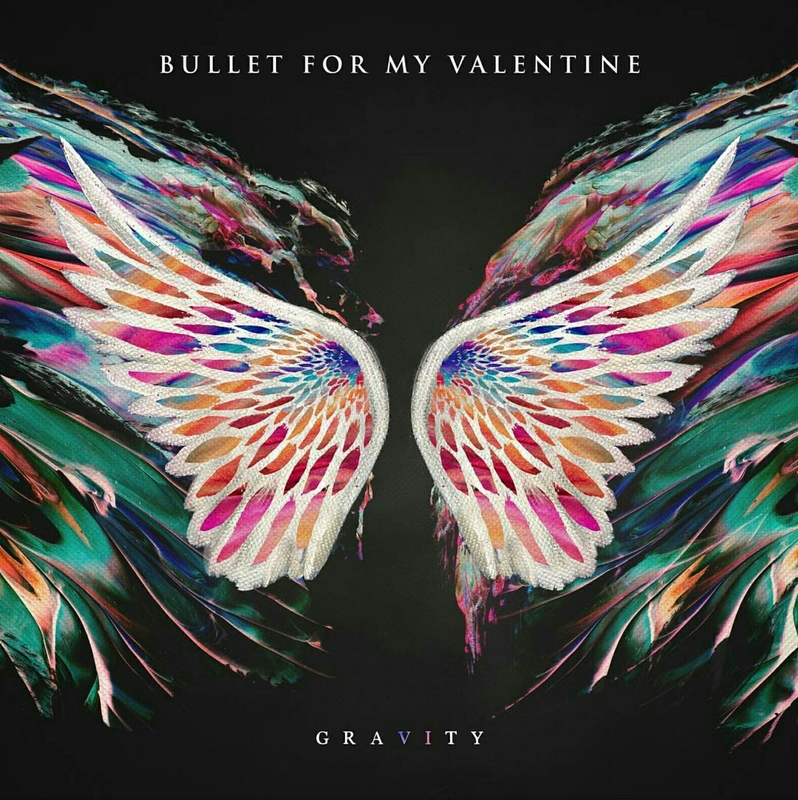 Avec 6 ème album, Gravity, sorti le 29 juin 2018 chez Spinefarm Records, Matthew Tuck (chanteur, guitare), Michael Paget (guitare), Jamie Mathias (basse) et Jason Bowld (batterie) osent changer drastiquement la formule sonore et marquent ainsi une sorte de nouveau départ qui pourra surprendre. Des éléments électro, des synthés, des guitares lourdes, des frappes puissantes, des refrains catchy et dynamiques, de l’émotion, Bullet for My Valentine délivre un très bel album varié que personnellement, j’aime beaucoup. J’ai eu le grand plaisir de rencontrer le nouveau membre de la bande, Jason Bowld et avoir une longue discussion sur l’album, sa passion pour la batterie, sa playlist, l’ amour pour l’Europe et bien plus encore. Interview fun et très généreux. Jason, c’est ton premier album en tant que membre officiel de Bullet for My Valentine, comment ça s’est passé ? Jason : C’était incroyable. C’est venue naturellement car je joue avec eux depuis fin 2015 et on a tourné ensemble toute l’année 2016. Nous avons commencé à écrire l’album en avril 2017 et ça a été un travail difficile car le groupe a opté pour un changement de sound et cela a causé quelques divisions dans le camp. Je pense que c’est toujours comme ça quand vous écrivez un nouvel album. Chaque album est un défi et cela doit l’être car nous avons des fans fidèles que nous devrons satisfaire. Parlons un peu de ce changement du son. J’ai trouvé le son très heavy mais très mélodique en même temps. Es-tu d’accord avec moi ? C’est un album très contrasté et très éclectique, ce sont les mots clés de Gravity. Jason : Oui, c’est juste. Je pense que c’est l’album de Bullet le plus heavy et en même temps le plus mélodique de tous les temps. C’est un album très contrasté et très éclectique, ce sont les mots clés de Gravity. Chaque chanson a son propre truc différent mais aussi un trait commun : les paroles et le chant sont très puissants. Le thème de l’album, les paroles évoquent les tourments de Matt ces dernières années avec sa séparation et la dissolution de ses d’amitiés dans le groupe. Cela peut paraitre négatif, mais je pense que finalement cela a une consonance positive car il s’agit d’un nouvel départ et cela pourrait être une renaissance en quelque sorte. Jason : Oui, c’est vrai. Je pense que certaines personnes pourraient dire, hey vous êtes un groupe de métal, vos paroles sont un peu sirupeuses. Mais je pense qu’il est plus difficile des chanter sur des choses qui arrivent dans la vie réelle qu’il est de chanter sur donjons et dragons. C’est un vieux cliché, mais je pense que beaucoup de gens se retrouverons dans ces paroles car vous pouvez les interpréter comme vous voulez. Le message est intime, personnel et profond. Et Gravity – comme le titre de l’album ? Jason : Gravity a été la première chanson que nous avons écrite. Nous n’avons vraiment pas choisi le nom de l’album avec un message spécifique mais accidentellement le numéro 6 comme sixième album, est écrit en chiffres romains « VI » dans le mot « GRAVITY » donc cela fonctionne plutôt bien. Et puis « gravité » reflète l’album avec ses moments lourds et légers. Nous avons trouvé cool d’avoir un seul mot pour le titre de l’album : c’est simple et efficace. En tant que batteur, quelle est ta chanson préférée sur l’album ? Jason : Piece of Me. J’adore cette chanson comme chanson et aussi pour travail de drumming. Il y a un groove tout à fait unique et elle est plus difficile à jouer que les gens peuvent y penser. Il y a beaucoup de feeling. Il y a un style urban groove funky dans le verset et la double frappe dans le refrain, beaucoup de bonne dynamique. J’aime toutes les chansons qui ont cette de la dynamique soft – heavy. Et ta chanson préférée à jouer live parmi toutes les chansons ? Jason : J’aime 4 Words parce que le son est très lourd et la cadence rapide. J’aime aussi jouer Tears don’t fall – c’est tellement, catchy, anthemic et j’aime entendre les fans chanter les paroles. Que pourras-tu me dire sur le processus d’écriture de l’album ? Et un peu plus sur une de mes chansons favorites de l’album Under Again. Jason : Le processus d’écriture a été varié. Quand nous avons commencé l’écriture de l’album en avril 2017. Nous avons commencé par faire du jamming sur des morceaux métal mais on était un peu à plat. Nous étions un peu perdus, nous ne savions pas dans quelle direction aller. Nous ne voulions pas d’écrire le même album encore une fois et donc il fallait trouver une autre source d’inspiration. Matt est souvent allé écrire avec Matt Schwartz, un producteur célèbre dans le milieu de la musique dance – électro. C’était sa façon de trouver de nouvelles inspirations, donc Letting You Go et Under Again sont nés de ce processus. Gravity a été donc la première chanson que nous avons écrit et ensuite nous avons co écrit For The Very First Time avec notre producteur. Pour le reste, nous avons écrit en partant de ces chansons de base qui ont été une sorte de catalyseur pour trouver des directions différentes. Donc dans l’ensemble, qu’est – ce qu’il a été le plus difficile d’écrire cet album ? Jason : Je pense que le plus difficile était de garder la confiance et la foi dans cette nouvelle direction pendant 8 mois. C’était un peu une prise de tête. Ce nouveau sound, on l’a ressenti comme une étape radicalement différente pour Bullet. Est-ce qu’on fait le bon choix ? Mais finalement, c’est une direction différente mais pas massivement différente, parce que les Bullet ont toujours été un groupe éclectique, il n’a jamais été jamais un groupe metal core, ils ont toujours eu des chansons heavy et des chansons mélodiques. Nous avons eu des désaccords ce qui est normal car il est difficile d’avoir 4 personnes s’entendre sur quelque chose tout le temps, mais nous voulions faire ce qui était bon pour le groupe, pour notre carrière et pour les fans, alors oui, c’etait un processus douloureux. Nous avons fait tout notre possible et nous espérons que les fans vont l’aimer, et ils vont l’aimer parce que nous croyons en lui, et quand vous croyez en quelque chose votre vœu est exaucé. Vous avez changé de label aussi. Comme ça se passe avec Spinefarm record ? Jason : Cela ne pouvait pas se passer mieux, parce qu’ils ont beaucoup d’amour pour le groupe. Ces sont des gens expérimentés qui travaillent dans l’industrie depuis des années et ils savent exactement comment ça marche. Ils ont été d’un très grand support. Ils nous ont permis d’aller dans différents studios pour écrire et avoir la possibilité de trouver de creative vibes pour l’album. Jason : Oui, j’ai commencé quand j’avais 11 ans. Je viens d’une famille musicale, mon père était dans un groupe. Il jouait de la guitare, il a joué beaucoup du hard rock, du Black Sabbath. J’ai été passionné par batterie très tôt et quand j’ai eu 20 ans, j’ai commencé à m’aventurer et j’ai rejoint un groupe appelé PitchShifter. J’ai fait un album avec eux, j’ai fait le tour du monde deux fois. Ensuite, j’ai été batteur de session, un peu mercenaire. J’ai joué avec beaucoup de personnes et des groupes différents comme Killing Joke. J’ai aussi eu un side-project avec Matt, AxeWound et voilà comment je me suis impliqué avec Bullet. J’ai commencé à jouer avec eux en 2010 sur la tournée Arena et c’est comme ça que nous avons développé notre amitié avec Matt. Je joue à 100 % avec eux depuis fin 2015 et maintenant, je suis un membre à part entière. Je me suis engagé dans le groupe parce que je crois en Bullet. Tout est incroyable, en particulier les fans. 6 albums, pas beaucoup de groupes ont survécu si longtemps ces années. Ça vaut la peine lui consacrer ma vie. Maintenant, c’est plus facile à former un groupe, mais il est difficile de le garder. Le secret de la longévité est comme dans toutes les relations. Vous devrez travailler dur, tout le temps. Ne jamais se reposer sur ses lauriers. C’est un travail constant. Le 6ème album n’était pas facile car il fallait faire mieux que tous les autres. Un batteur qui t’a influencé particulièrement ? Jason : Il y a plusieurs. Quand j’étais très jeune et parce que mon père était dans Black Sabbath, c’était Bill Ward. J’aime son jeu de batterie. J’aime aussi Mitch Mitchell qui a joué avec Jimi Hendrix. Pour les plus modernes, quand j’étais adolescent – Dave Lombardo de Slayer. Qu’est-ce qu’il y a dans ta playlist ? Jason : Ma playlist ? Tu vas être choquée. Il n’y a pas beaucoup de métal parce que je joue de heavy metal tout le temps, donc j’ai besoin d’une pause. Je suis allé voir Def Leppard, ils sont encore très bons. Ça m’a rappelé de ma jeunesse, donc je vais écouter a un peu de Def Leppard. Avec Spotify, tu peux faire ce que veux, écouter quelques chansons d’ABBA ou retrouver les chansons qui ont marqué une période de ta vie. J’adore Nine Inch Nails, je suis un grand fan de Chelsea Wolf – une artiste américaine pas très connue – un peu style gothique, sombre. Mais en fait, ma playlist change tout le temps. Nous avons tourné avec Avenged Sevenfold et j’ai écouté beaucoup de leur musique. J’aime des trucs des années 80 comme Duran Duran. Jason : Vraiment ? Leurs chansons sont si géniales, les gens veulent toujours entendre leurs vieux trucs. Puis j’écoute Depeche Mode, Michael Jackson, Pantera. Un peu de tout. j’ai plusieurs playlists – (il sort son téléphone portable, et il commence à regarder). J’ai une liste de heavy metal, j’ai une liste « spécial running » car j’aime bien courir. Tu trouves tout Air, Charlotte Gainsbourg, UNKLE – un groupe très cinématographique, style alternatif, très éclectique, The Prodigy ou Orbital. Jason : Je joue de la guitare mais je ne suis pas très bon. J’aime écrire ma propre musique. Je suis gaucher et je joue de manière très peu conventionnelle. Je tourne la guitare à l’envers (rires). C’est mieux que de se mettre la tête en bas. Question mode, quelle est ton style dans la vie de tous les jours et sur scène ? Jason : Je pense qu’il est important de mélanger et assortir les vêtements pour créer ta propre identité. J’aime les trucs de All Saints. Leurs vêtements ne sont pas si chers et c’est une très bonne qualité, mais on peut trouver de trucs sympas chez Asos ou H & M.
Sur la scène est assez difficile car je joue de la batterie et j’aime avoir un peu de liberté. Généralement, je porte de shorts et tee-shirts un peu loose, mais j’aimerai être un peu plus créatif, comme porter des tenues un peu folles sans être recouvert de paillettes. En fait, je suis un gars simple donc je voudrais rester simple, sans de prétentions. C’est mon vibe. Avez-vous un code ou une couleur pour les tenues de scène ? Jason : On essaie et on a discuté de ça. Matt comme c’est le chanteur donc c’est plus important pour lui, il est au centre de l’attention. Il va être dans les photos plus que nous, à cause des médias sociaux. Je pense que beaucoup de musiciens ne font pas trop attention à leur image. On est là pour divertir les gens en fin de journée et c’est important. Vous devez mettre un peu d’effort sur ce que les gens vont voir. Vous envisagez de porter des costumes à nouveau ? Jason : Nous avons portés les costumes toute la tournée européenne et c’était tout à fait efficace peut-être un peu trop et très inconfortable, mais ça a marqué les esprits. C’était une tournée spéciale parce que c’était le 10ème anniversaire de l’album Poison et nous avons voulu faire les choses différemment. Qu’en est-il de la tournée ? Jason : Nous serons en Europe pour les festivals d’été, au Japon en août, puis US en septembre de retour en Europe octobre et novembre, Australie possible en décembre et probablement même type de tournée l’année prochaine. J’aime l’Europe. J’aime y revenir que c’est mon endroit préféré de la tournée. J’aime le fait que vous pouvez être dans différents pays en une heure ou deux, j’aime la nourriture et les gens sont comme une famille. Je me sens à la maison en Europe. Je suis vraiment triste que l’UK quitte l’Europe. Et les fans ? Ils sont différents en Europe, Asie, Etats-Unis ? Jason : Certainement ils ont quelque chose en commun : ils sont très passionnés et ce sont des gens adorables. Il n’y a vraiment aucune agressivité dans nos fans, ils sont intelligents et ils apprécient la bonne musique bien évidemment. Mais ils pourraient être différents aussi d’un pays à l’autre. Lorsque nous avons joué en Europe pour la dernière tournée, nous avons eu un couple de Français qui nous ont suivis partout, pour chaque concert. On s’est lié d’amitié avec eux, nous avons bu quelques coups ensemble. Ce sont des gens vraiment sympas. Je ne pense pas que beaucoup de groupes socialisent avec leurs fans. Certains groupes mettrons une barrière entre eux et leurs fans. Pour la fin, voudras-tu me dire quelque chose sur l’album et je ne t’ai pas demandé ? Jason : Je t’ai déjà tout dit (rires). Je pense que c’est plus des espoirs et des désirs. J’espère que la Bullet family aime l’album autant que nous avons aimé à l’écrire. C’est vraiment sincère et authentique. Nous pensons que c’est la meilleure chose que le groupe a faite. Nous aimerions que les gens l’écoute comme un album et pas seulement une chanson par ci par là. Il faudra s’asseoir et écouter de bout en bout comme un album parce que c’est un peu comme un voyage : il y a une ouverture puissante, beaucoup d’émotion angélique au milieu et une fin robuste. On y a mis beaucoup d’amour.